historylearningsite.co.uk. The History Learning Site, 22 May 2015. 6 Apr 2019. Guadalcanal is part of the Solomon Islands which lie to the north-eastern approaches of Australia. Though it is a humid and jungle-covered tropical island its position made it strategically important for both sides in the Pacific War. If the Japanese captured the island, they could cut off the sea route between Australia and America. If the Americans controlled the island, they would be better able to protect Australia from Japanese invasion and they could also protect the Allied build-up in Australia that would act as a springboard for a major assault on the Japanese. Hence the importance of the island.The Japanese defeat at the Battle of Midway had forced planners in the Imperial Army to reconsider their plans of expansion and to concentrate their forces on consolidating the territory that they had captured. 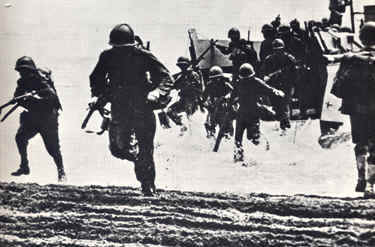 The victory at Midway was also a turning point for the Americans as after this battle, they could think in terms of re-capturing taken Pacific islands – the first confrontation was to be at Guadalcanal.